Alton Towers is in an unprecedented third day of closure, following the worst accident in the theme park’s history. When the Smiler rollercoaster collided and seriously injured four guests on Tuesday, the whole country seemed to be stunned by the news. There is something about being injured in an environment of fun and escapism which has always seemed to massively spike public interest. And rightly so, as there can be no justifiable reason why such accidents happen. For all the valid claims of aeroplane rides and car journeys being statistically far more dangerous than a visit to a theme park, the Smiler’s operating systems still catastrophically failed. Excluding the prospect of an unthinkable deliberate act, the only remaining logical option is one involving system failure – be that procedural (involving staff) or technical (computers and instrumentation). Given that the section of track containing the stationary train is covered by CCTV, and displayed on screens in the ride’s control rooms, blaming computers entirely might be flawed. 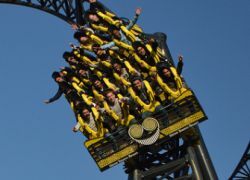 Nevertheless, and for whatever reason, Merlin Entertainments is not convinced that Saw – The Ride – a rollercoaster similar to the Smiler – can be safely operated at its sister attraction Thorpe Park. It has been closed since the Smiler’s crash. As the Health and Safety Executive so finely puts it, its job is to establish the facts. They are certain to find failed systems of some nature – but either way involving people or technology. Any identified system of relying too heavily on computers, and insufficiently on the tried and tested methods of visually checking and counting in and out, would have to be a flawed one. Regardless of the investigators’ published conclusions – which could be some way off – the effect of human factors is almost certain to be determined as having played a crucial role.